Route. 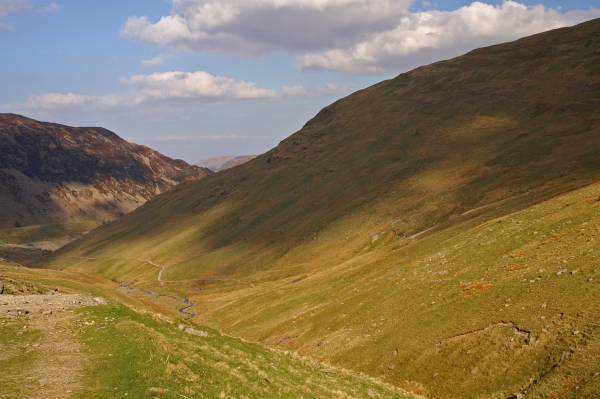 Glenridding - Greenside Road - Greenside Mine - Keppel Cove - Catstye Cam - Red Tarn - Hole-in-the-Wall - Birkhouse Moor - Little Cove - Glenridding. Notes. On a glorious spring day like today I found myself in Ambleside rambling round the walking shops, Ambleside was dead, every self respecting walker was in the hills and that's where I should be, Sue needs a new pair of boots Kirsten's nicked hers, she did all the trying on but never got to the handing over of the cash, no doubt we'll be back, we were home in time for a certain football match, I sat down to watch the said match when an evening stroll out of Glenridding seemed a much better idea, I threw a head torch in the bag just incase I found myself descending in the dark and off I went. From the main car park in Glenridding I made my way up Greenside Road passing the old miners cottages under Blease Crag as I strolled up the Glenridding valley, it was easy walking on a hard surface untill I reached the remains of the Greenside Mine, a finger post pointed to Kapple Cove, that was where I would make my ascent on Catstye Cam. On entering Kapple Cove I found my intended route across the old dam wall blocked by wooden fencing, warning signs advised walkers to keep off, the dam's been there over a hundred years I'm sure my weight wouldn't bring its downfall, I climbed the fence and crossed the dam wall, safe on the other side I hunted for the path that would lead me to the summit of Catstye Cam. 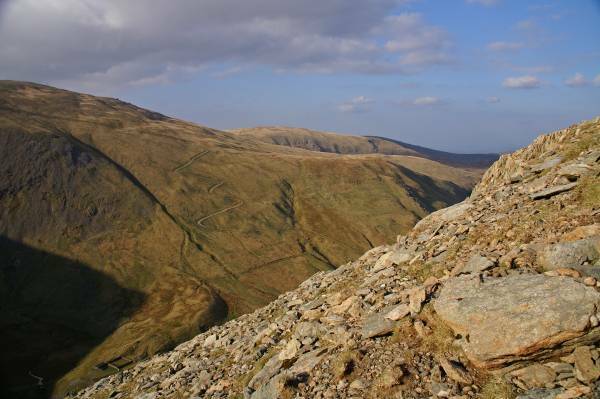 This narrow path follows the line of the ridge straight up, painfully steep, narrow and hands on in places, quite exposed in others a proper mountain path. 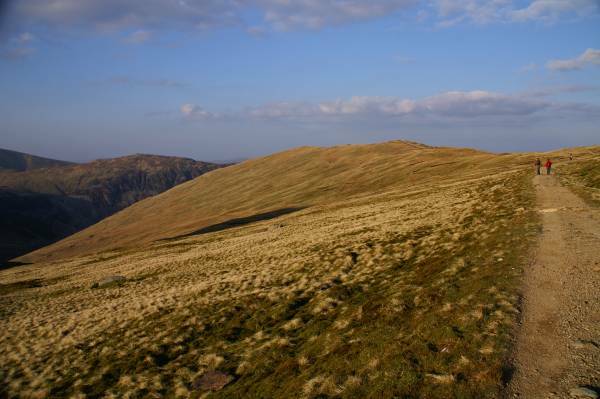 I reached the summit with burning legs, gasping for breath, blinded by sweat what a brilliant way onto the hill. 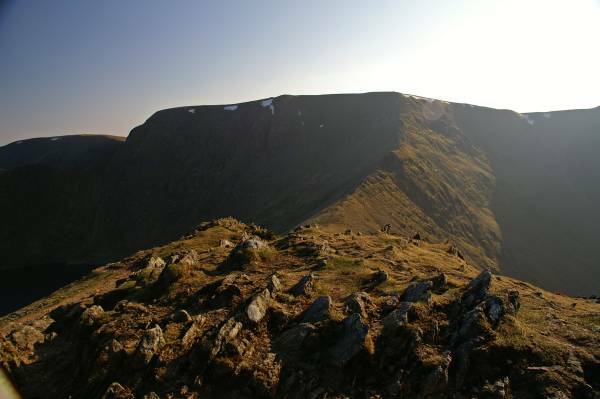 After ten minutes recovering I made my way towards Swirral Edge before descending to the left passing the outflow of Red Tarn en route to the Hole-in-the-Wall, I stayed on the Glenridding side of the wall as I made my way to the summit of Birkhouse Moor. Back to the wall it was down hill all the way ignoring the main path down Mires Beck through Little Cove, I followed the wall down to Keldas before taking the main path through Westside back to Glenridding. 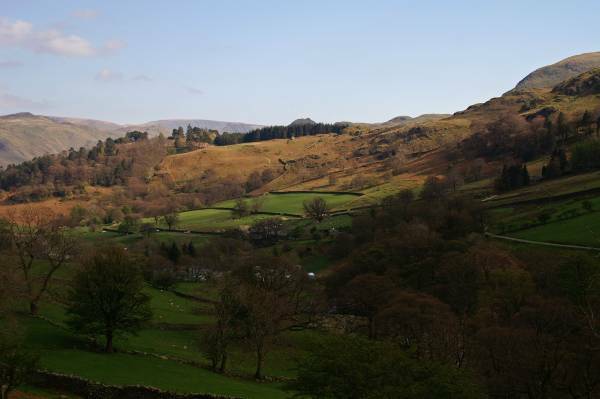 From the Greenside Road views to Keldas across the Glenridding Valley. 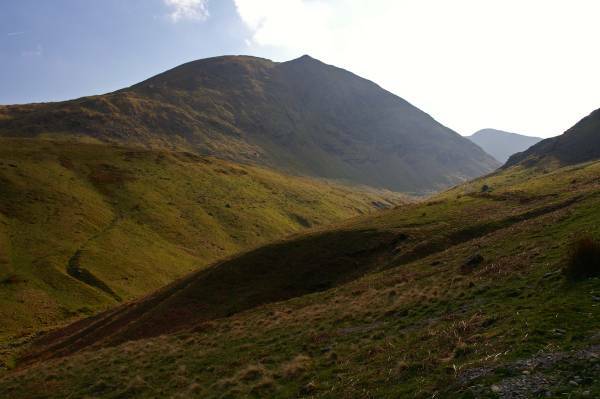 First view of Catstye Cam, my route follows the dark ridge climbing from right to left, any reservations,"yes". 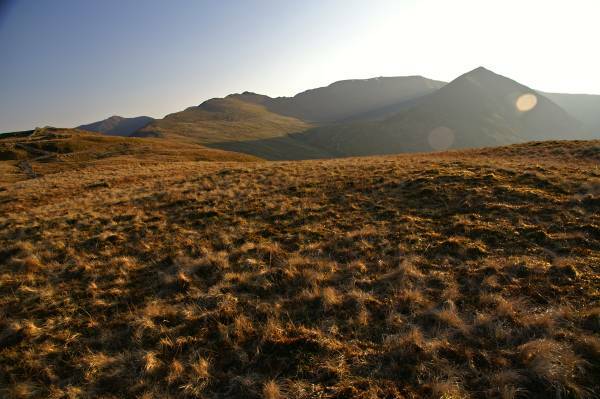 Dappled evening light on the slopes of Birkhouse Moor. 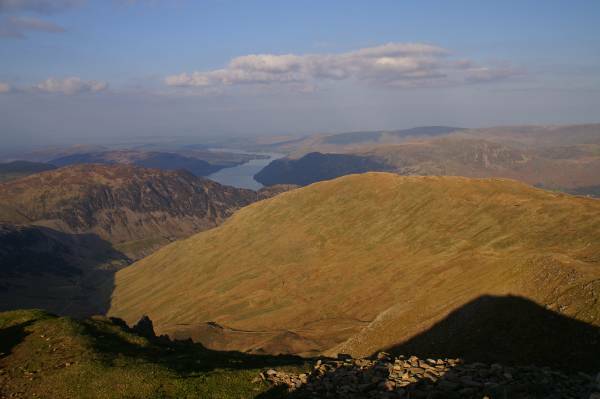 On the adrenalin fueled ascent of Catstye Cam. 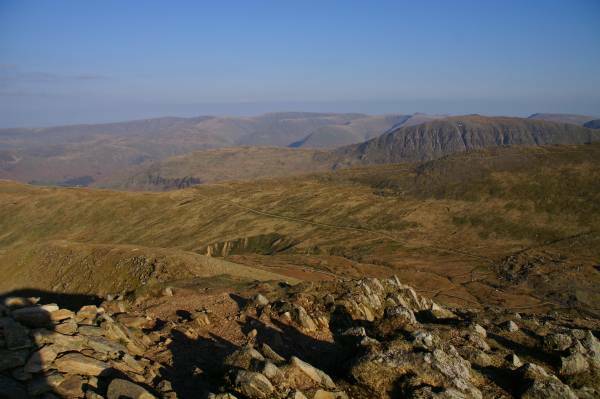 Taking a breather on the summit of Catstye Cam giving myself time to soak up the views, looking to St Sunday Crag backed by Coudale Moor and the High Street massif. 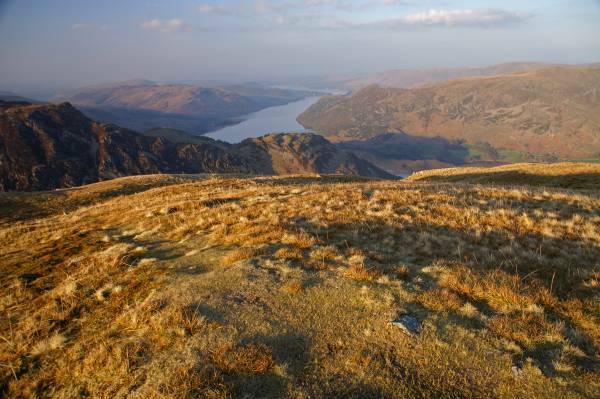 A quite magical view over Birkhouse Moor taking in Sheffield Pike (left) and the dog leg shape of Ullswater. 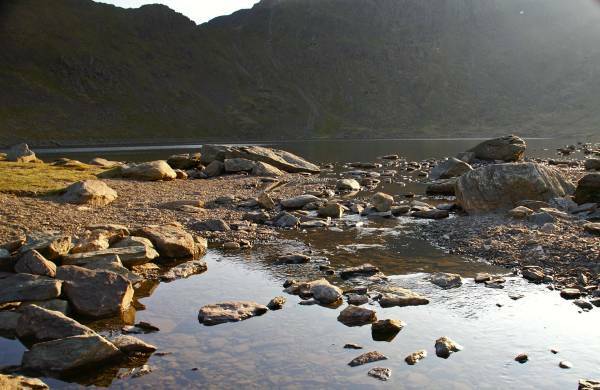 A slice of the picturesque, Striding Edge across Red Tarn. 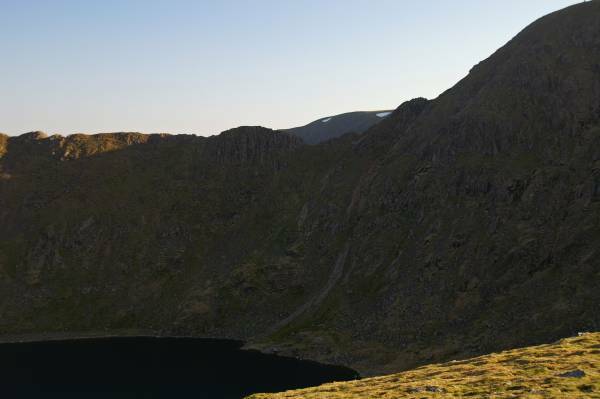 Striding Edge in the shadow of Helvellyn. Looking to White Stones over Stang, in the foreground the valley cut by Red Tarn Beck. 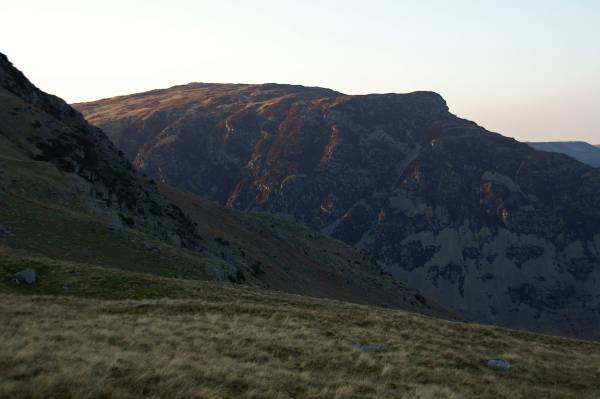 Ahead Birkhouse Moor, next on the agenda. 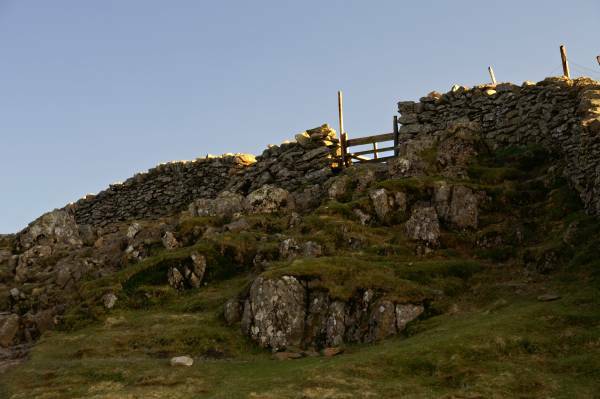 But first the Hole-in-the-Wall gateway to the best fell walking in Britain. 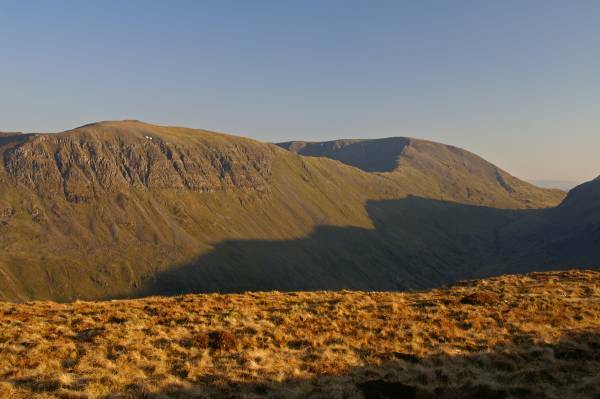 St Sunday Crag and Fairfield seen over Grisedale. 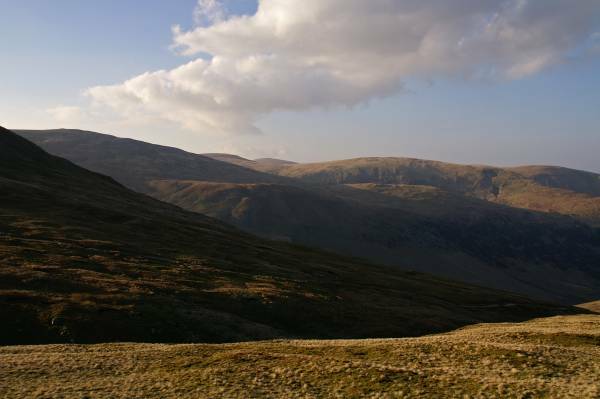 Above Grisedale looking to Coudale Moor. 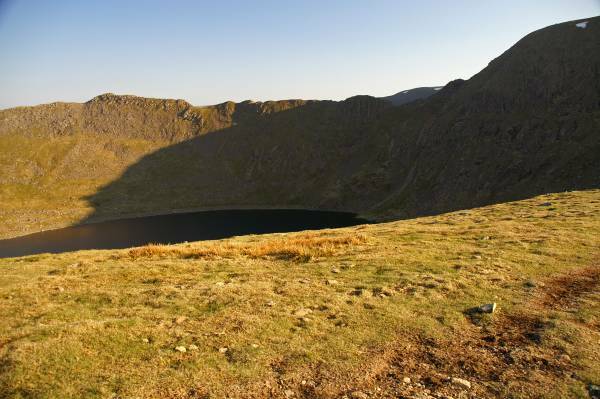 From the summit of Birkhouse Moor stunning views to Helvellyn, for any one attempting the edges this is a perfect spot to survey your route. 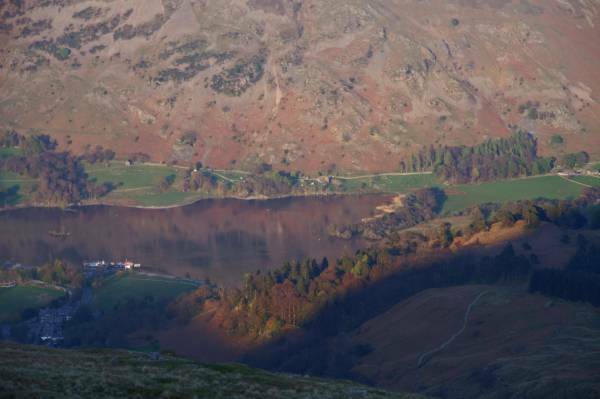 Magical views the length of Ullswater. The shadows are getting longer it's that magic time as day turns to night, the last shaft of sunlight across Keldas and silence. 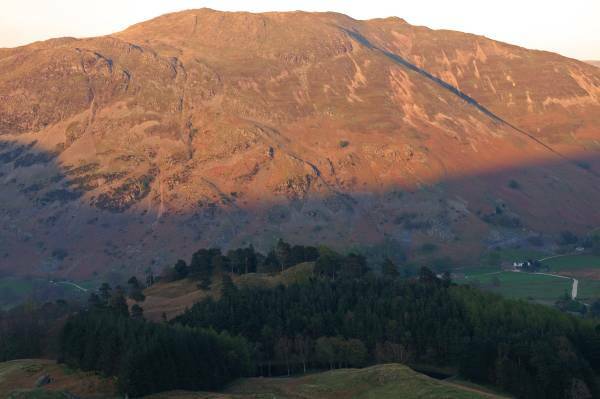 Seen across Glenridding catching the last of the light Sheffield Pike. 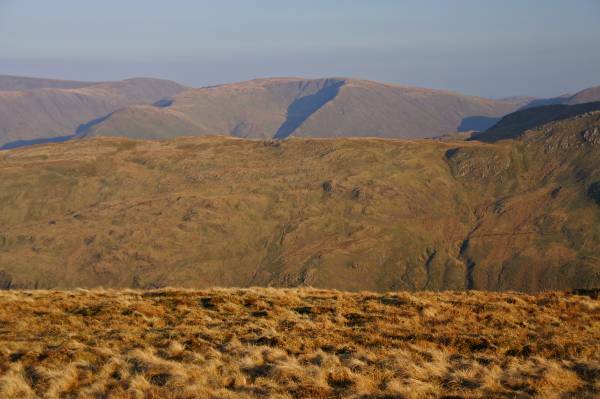 Looking down to Keldas with Place Fell rising above Patterdale. 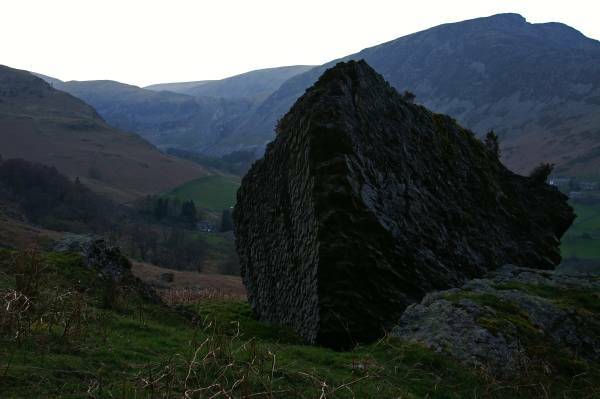 My route down passed this giant slate boulder before reaching the main path over Keldas, from here it was a short walk down hill back to Glenridding.